We reached our campsite at 6100 ft by 4 PM, at the edge of some rocks near the toe of the Sulphide Glacier. 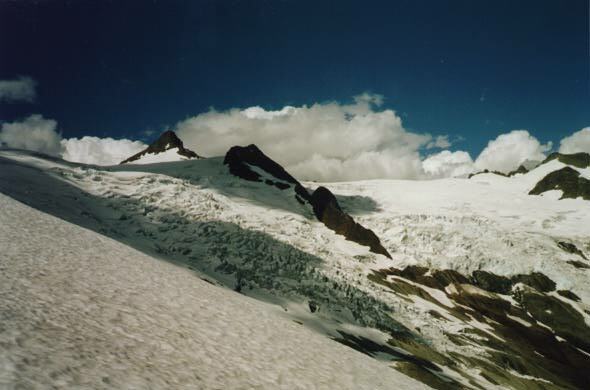 Looking north, we see the summit pyramid in the upper left, with the heavily crevassed east side of the Sulphide Glacier below it and the Crystal Glacier off to the right. Our climbing route will follow the uncrevassed west edge of the Sulphide (out of picture to left) to the base of the pyramid.